Do you know what is the maximum force a human bite could exert? Surely not more than 160 pounds per square inch (psi). You may feel a little pain or your skin may break by a human bite. The question is, what would be the bite effect when an animal that has 10 or 20 times more powerful bite force than human? Yes, such animals with exceptional bite force live in this world. Here the list of 10 most powerful animal bites. As you know, a lion is regarded as the king of a jungle. But when checking the biting force, he is far away from other big animals in the cat family. Lion’s bite force only measure 650 pounds per square inch (psi). It is considerably weak when compared to bite force of other big cats like jaguar or tiger. Lion is the only true social cat that lives in groups called pride. They also work in a group to take down big prey like buffalo or young elephants. So, for such a social animal, which live and hunt in groups need not have high bite force for living. That’s one main reason behind the weak bite force of lions. Weighing up to 933 lbs (Siberian Tiger) tiger is the largest of all cats in the world. It is stronger and faster than lions. 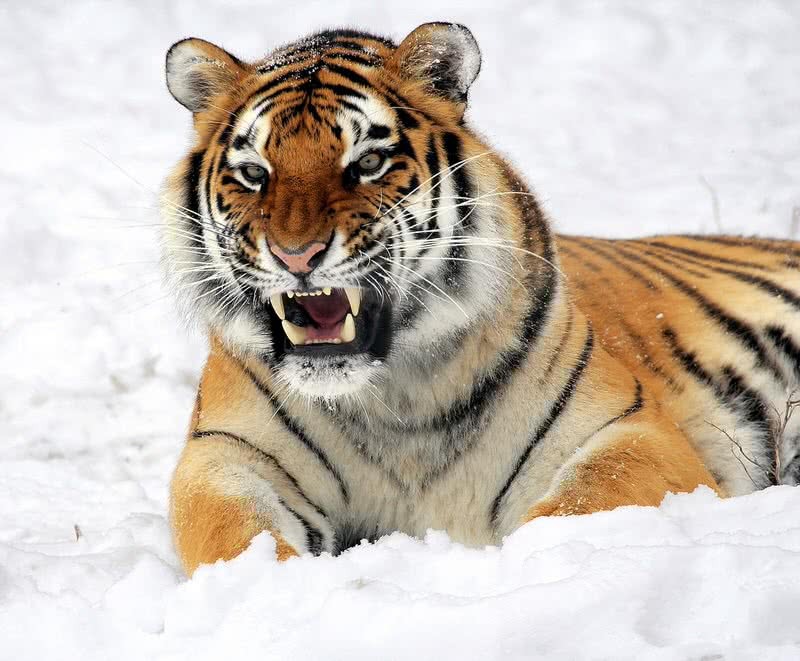 At 1050 pounds per square inch (psi), the bite force of a tiger is almost twice as stronger as a lion. Unlike lions, the tiger is a solitary animal. He lives and hunts alone except during mating season. The agility along with strong bite force let tigers take down any large prey alone. This big cat also has no natural enemy. It’s an apex predator. A well-known scavenger of Africa. You may underestimate hyena as an animal that only feeds on leftover by other animals. The truth is, most time, they find food themselves by hunting. They have exceptionally powerful jaws. 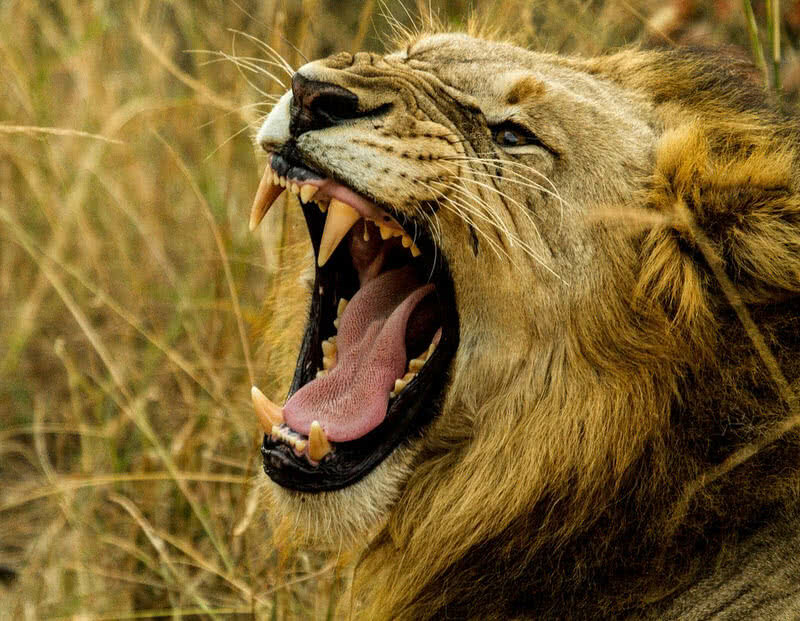 Their bite force measured at 1100 pounds per square inch (psi), which is more powerful than lions and tigers. 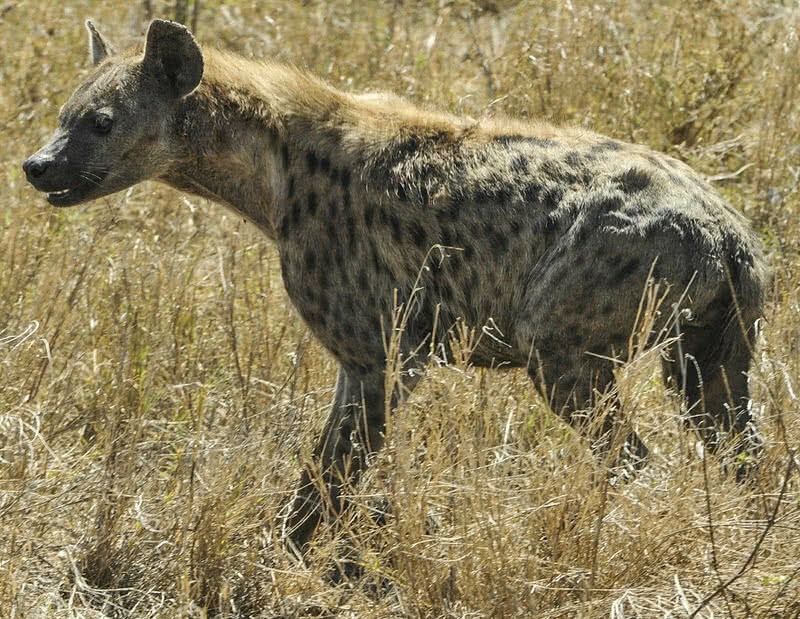 The spotted hyena is a social animal which lives in large groups called clans. In large groups, spotted hyenas aim for large prey like cape buffalo, wildebeest or rhino. Their bite is strong enough to crush the bones of the prey. Spotted hyenas also could eat their prey as a whole even without leaving its bones. A grizzly bear is a subspecies of brown bear that inhabits in North America. This large species of bear stands 7 ft in height and up to 800 lbs in weight. Not just this great size, grizzly bears also have a keen sense of smell, long claws, and powerful jaws. With 1200 pounds per square inch (psi) bite force, a grizzly bear could easily bite through a cast iron skillet, thick trees or bones. Without any doubt, grizzly bear is a symbol of strength. Their attacks on human are very rare. But they are very aggressive. So, you need to be very careful when going near their territory. 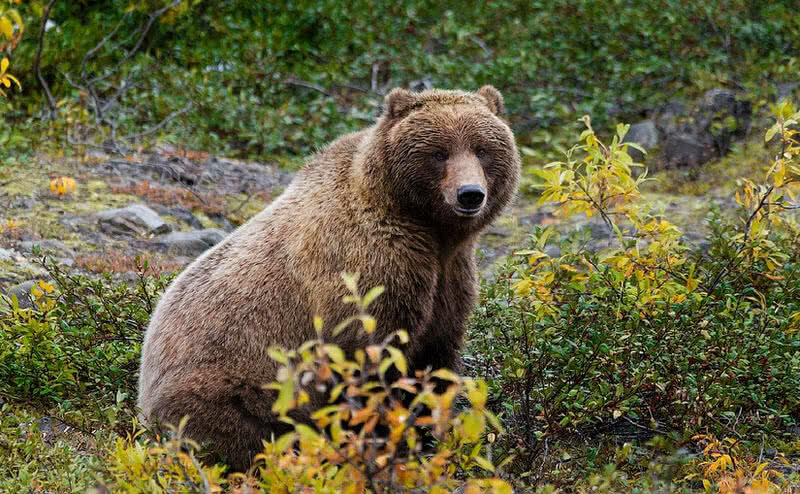 If feel threatened, a grizzly would definitely attack and it could be fatal. Standing 1.73 m. in height and weigh up to 352 lbs, a gorilla is the largest of all primates. Despite the great size, gorillas are generally gentle and shy. But, in addition to great size, gorillas also have strong jaws and long sharp canine. Their bite force is also measured at 1300 pounds per square inch (psi). You may ask why gentle gorilla need such sharp canine? 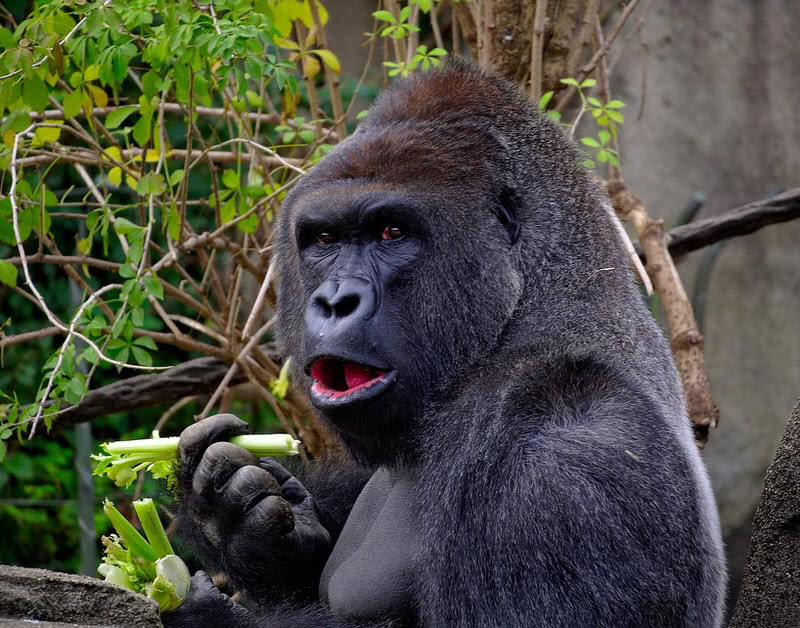 First of all, gorillas mainly feed on plant materials. To grind some tough food like bark or roots gorillas need strong teeth. But, the long canine is what most people afraid off. Gorillas also use their long canine to scare off external threats. Jaguar has the strongest bite than any other big cats. 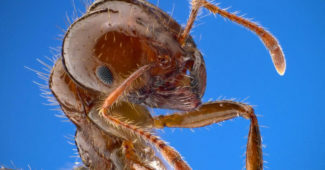 Its bite force calculated at 200 pounds per square inch (psi). That’s almost twice as powerful than a tiger. Jaguars have such strong jaw muscles. 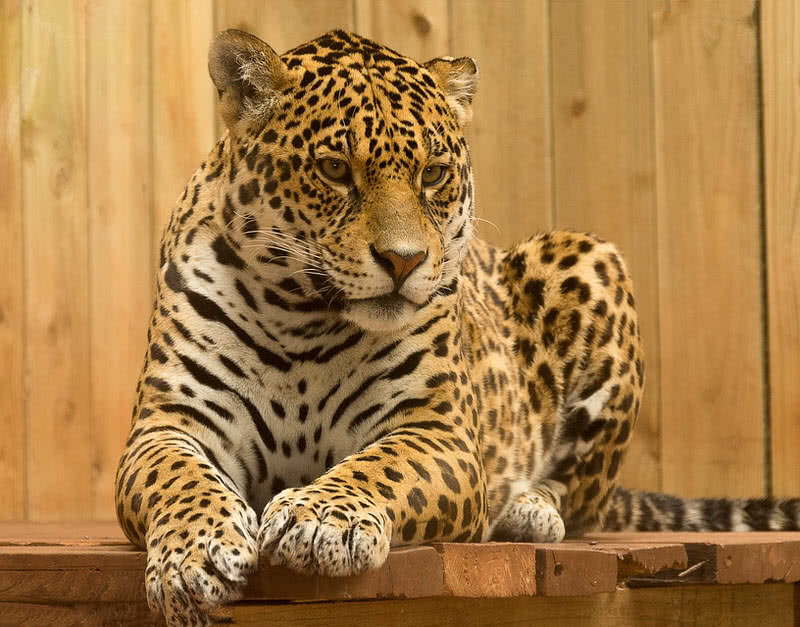 Jaguar is a solitary animal, lives and hunts alone. They are powerful hunters and their diet list include many animals including caiman and turtles. Jaguars use skull bite to catch the prey. In other words, a jaguar bite is strong enough to pierce through the skull of its prey. It could even break the strong turtle shell. 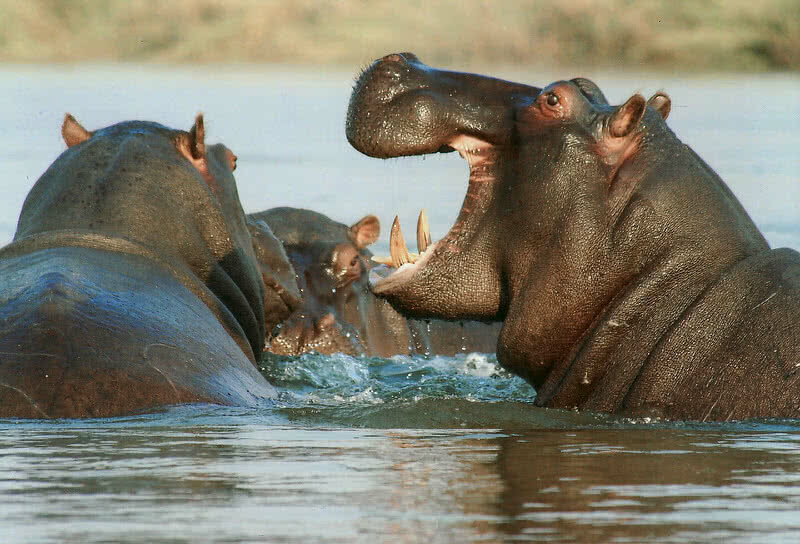 With 1825 pounds per square inch (psi) chewing power, Hippopotamus has the strongest bite force than any other living mammal. The big mouth of hippos contains large incisors and canines. These canine and incisors measure 1.8 ft and 1.4 ft. respectively. They also sharpen their teeth by grinding. Hippos use their large teeth to fight with external threats. Weighing up to 3968 lbs, hippos have a stocky look. Their legs are also short. Despite these physical features, hippos could run at a speed of 19 mph. They are very aggressive and totally unpredictable. Hippos would attack even without provocation. That’s why hippos are considered as one of the most dangerous animals of Africa. Measuring 11.2 ft in length and up to 1000 lbs in weight, the American alligator is the largest reptile in North America. Not the size but the bite force makes American Alligator so special. Measuring at 2125 pounds per square inch (psi), it’s the thirst most powerful animal bite in the world. With exceptionally powerful jaws, American alligators could tear the prey into pieces. 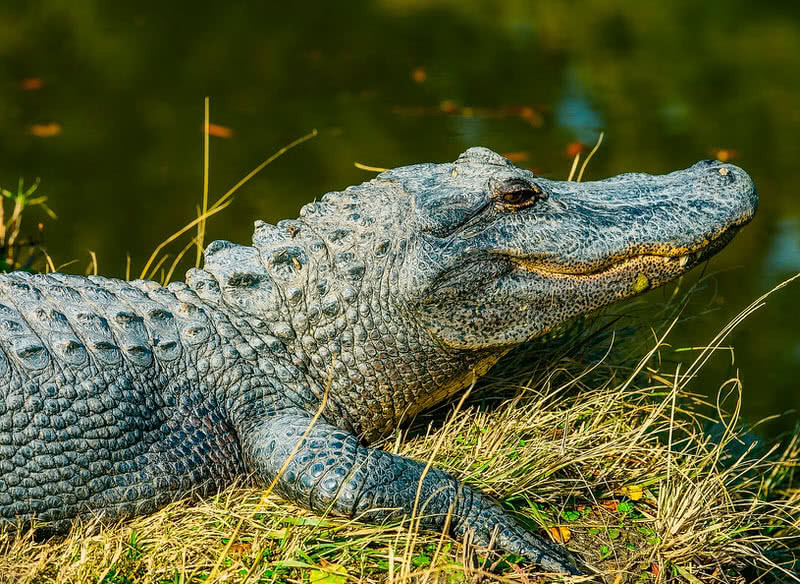 A fully grown American alligator has 75-84 teeth. If one tooth wears down, it would be replaced by a new one. One American alligator can go through 2000 to 3000 teeth in their lifetime. Even though American alligators have powerful jaws, the muscles for opening their jaws are very weak. Your hands are enough to close their mouth shut! Saltwater crocodile has the most powerful bite ever tested. In an experiment done by the National Geographic team, the bite force of Nile crocodile measured at 3960 pounds per square inch (psi). Their mouth contains 40 – 60 large teeth. But not the teeth but the large jaw closing muscles gives saltwater crocodiles such surprising biting power. Their muscles in opening the jaws are very weak. Saltwater crocodile is the largest reptile in the world. A fully grown saltwater crocodile measure more than 20 ft in length and up to 2200 lbs in weight. Their diet includes fish, birds, crabs, turtles, monkeys and water buffalo. The powerful bite itself that helps saltwater crocodile to catch the large prey like water buffalo. It is believed to be the bite for of a Nile crocodile is as high as 5000 pounds per square inch (psi). 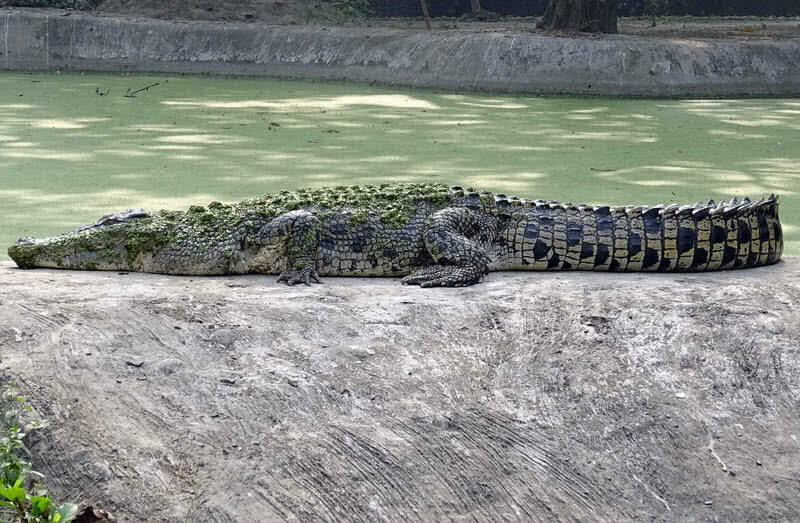 In such a case, Nile crocodile has the most powerful bite than any other living creatures in the world. The long, powerful jaws are well suited to grab the preys. The sharp conical teeth along with a powerful bite make it impossible to escape from the mouth of a Nile crocodile. In that way, a Nile crocodile could take down anything that comes within its reach. Nile crocodile is the second largest reptile in the world. They inhabit in rivers, marshes and swamps of Sub-Saharan Africa. An adult Nile crocodile measures 20 ft in length and up to 1650 lbs in weight. They have no natural predators. 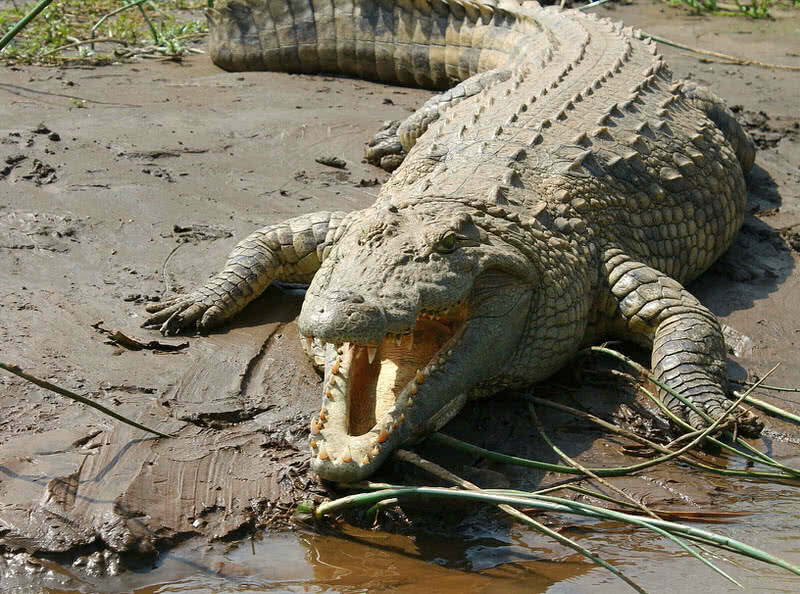 Nile crocodiles mainly feed on fishes, zebras, antelope, birds, and carrion.